better than i could have imagined: Lazy day. I went in and got her at 9 this morning (a good hour and half later than normal- which was the first clue).....picked her up and she was burning hot. She was completely covered with her blanket, so I thought that could have something to do with it, but really.....when your kid has fever, you know it. I remember being a first time mom with Parker and with even a runny nose I would take her temp. And she never had one. Until the day that she did (funny how that works out)....and I knew without taking her temp. Their little bodies are just so hot. You may need a thermometer to tell how how they are, but when they have a fever, you know. You know? She was in pretty good spirits at this point and her temp was only 99.7 (which is technically not fever.....not until it reaches 100.4) But I had a feeling it would get worse. And it did. Although I hate it when my kids are sick (which goes without saying).....I was glad to make it a lazy day. We missed story time (which I just wrote about last week....how Wednesdsays are now one of my favorite days with the girls) I brought their chairs into the living room and let them watch more TV than normal. Of course, they loved this. Since Grace was still acting "not-quite-so-sick" yet, we ran to Hobby Lobby real quick to pick up some fabric I needed to finish a dress for the girls. 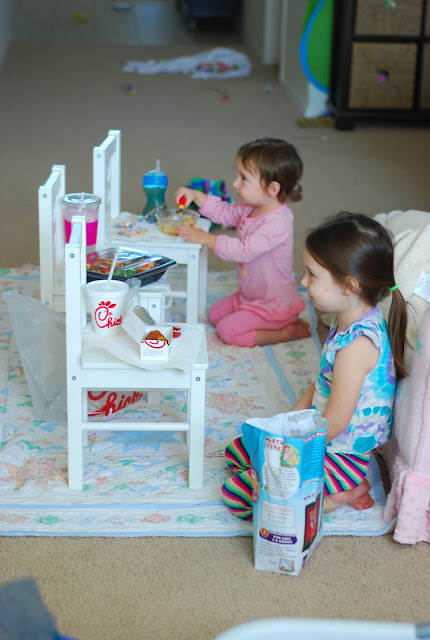 As a treat- we picked up Chic-fil-A and came home for a picnic. Parker really loves this. On a side note- Grace doesn't really eat their chicken....but I got her the chicken soup and she ate it. By the time lunch was over....Grace started sitting in my lap....she started getting warmer. And started acting more like she didn't feel well at all. She took a 3 hour nap.....which I woke her from. Both girls tried, then turned their noses up at it. Typical. So they had oatmeal for dinner. Poor baby!! I hate that!!! Stinks when they are sick!!! Poor baby!! Hope she is better! !